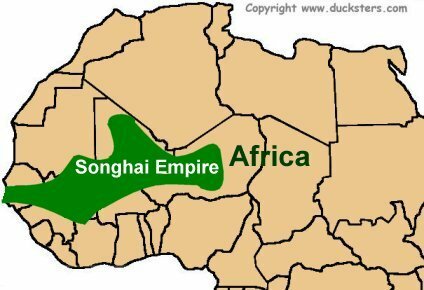 Where was the Songhai Empire located? The Songhai Empire was located in Western Africa south of the Sahara Desert and along the Niger River. At its peak, it stretched well over 1,000 miles from the current modern day country of Niger to the Atlantic Ocean. The capital city of the Songhai was the city of Gao which was located in modern-day Mali on the banks of the Niger River. When did the Songhai Empire rule? The Songhai Empire lasted from 1464 to 1591. Prior to the 1400s, the Songhai were under the rule of the Mali Empire. How did the Empire first begin? The Songhai Empire first came into power under the leadership of Sunni Ali. Sunni Ali was a prince of the Songhai. He was being held as a political prisoner by the leader of the Mali Empire who ruled over the Songhai. In 1464, Sunni Ali escaped to the city of Gao and took control of the city. From the city of Gao, he established the Songhai Empire and began to conquer nearby regions including the important trading cities of Timbuktu and Djenne. In 1493, Askia Muhammad became the leader of the Songhai. He brought the Songhai Empire to its height of power and founded the Askia Dynasty. Askia Muhammad was a devout Muslim. Under his rule, Islam became an important part of the empire. He conquered much of the surrounding lands and took control of the gold and salt trade from the Mali Empire. The Songhai Empire was divided into five provinces each led by a governor. Under Askia Muhammad, all the governors, judges, and town chiefs were Muslims. The emperor had total power, but he also had ministers who ran different aspects of the empire for him. They also counseled the emperor on important issues. The Songhai culture became a blend of traditional West African beliefs and the religion of Islam. Daily life was often ruled by traditions and local customs, but the law of the land was based on Islam. The slave trade became an important part of the Songhai Empire. Slaves were used to help transport goods across the Sahara Desert to Morocco and the Middle East. Slaves were also sold to Europeans to work in Europe and the Americas. Slaves were usually captives of war captured during raids on nearby regions. In the mid-1500's the Songhai Empire began to weaken due to internal strife and civil war. In 1591, the Moroccan army invaded and captured the cities of Timbuktu and Gao. The empire collapsed and was divided up into a number of separate smaller states. Sunni Ali became a legendary hero in Songhai folklore. He was often portrayed as having magical powers and was known as Sunni Ali the Great. If a prisoner of war had already converted to Islam before being captured, they could not be sold as a slave. A West African storyteller is called a griot. History was often passed down from generation to generation through the griots. The city of Timbuktu became an important city of trade and education during the Songhai Empire.